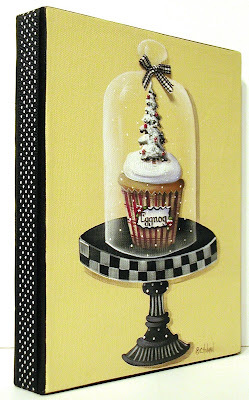 I had so much fun painting this little "Eggnog Cupcake" yesterday. 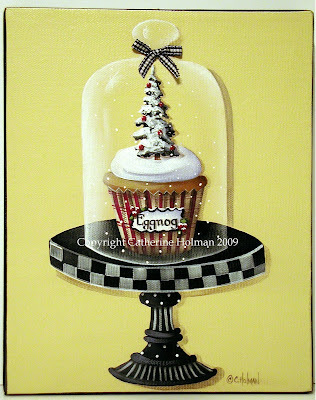 Let me know in my comments if you have any Christmas cupcake suggestions. I love it when my readers give me ideas. I'm starting another one today and should have it finished soon. Click here to check out the eBay auction for this painting. Santa's tiny elves whipped up this whimsical cupcake creation. They flavored it with eggnog and piled white fluffy frosting on top. Deciding that it needed something extra, they climbed the side of this cute black and white cake stand and placed a little Christmas tree into the top decked with red ornaments. This magical creation is tucked under a glass cloche where snow gently falls like a snow globe. A tiny black and white checked ribbon is glued below the knob on the cloche and a black and white grosgrain ribbon is wrapped around the edges of the canvas. Touches of glitter are applied to the frosting and the Christmas tree. 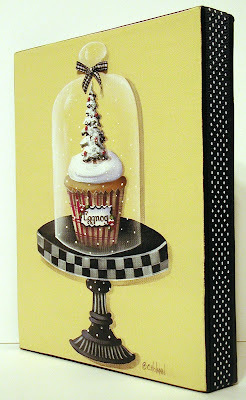 I found the cutest blog today called "Annie's Eats" and she has a recipe for Eggnog Cupcakes. Go and check it out because she has some great recipes to share. Well, this painting is so sweet and whimsical Catherine...I just love it. Eggnog is a favorite holiday drink of mine, that is for sure. Love your art. I also list paintings on ebay. Your blog is really nice too. Hope you can take a peek at mine sometime.